'Panoramic Heights' is a large (3000-square-foot), custom-built, luxury southwest (pueblo-style) house in an exclusive, upscale area of West Sedona. The home was recently furnished and decorated with an elegant southwest theme including native American art. With 11-foot ceilings throughout, 'Panoramic Heights' is spacious and luxurious, with breathtakingly gorgeous, unobstructed, panoramic views of Sedona's famous red rock formations and mountains. The home has new carpet and tile, and kitchen and bathrooms have gorgeous custom tilework throughout. Panoramic Heights has two bedroom wings (split floorplan), with a central living area (great room). We have recently replaced the hot tub in 2015 under our gazebo off back patio. The home has all the amenities of a four-star resort, and is perfect for family reunions, special family occasions, or an intimate retreat for two. Walls of windows with spectacular panoramic views - with the most famous red rock formations in Sedona: Thunder Mountain, Soldier's Pass, Chimney Rock, and Coffee Pot Rock. A short walk up the road from the home leads to one of the most scenic lookouts and trails in Sedona, as well as a vortex! The gourmet kitchen has Sub-zero refrigerator and Jenn-Aire appliances, and is fully-equipped for the gourmet cook. The master suite has a King bed, sleeper sofa, huge master bathroom with oversize jetted tub and separate tiled shower, walk-in closet, and flat screen TV. The master suite opens to a private patio with fabulous red rock views. The other three bedrooms have a queen, queen and twin, day bed and trundle. All beds have top-quality bedding, including high quality sheets and cozy down comforters. The home is filled with books, music, and movies for your use. We also have a crib, highchair, stroller, and backpack to carry a child up to 40 pounds, toys, and children's videos, for your use! We also have wireless, high-speed internet access for renters. 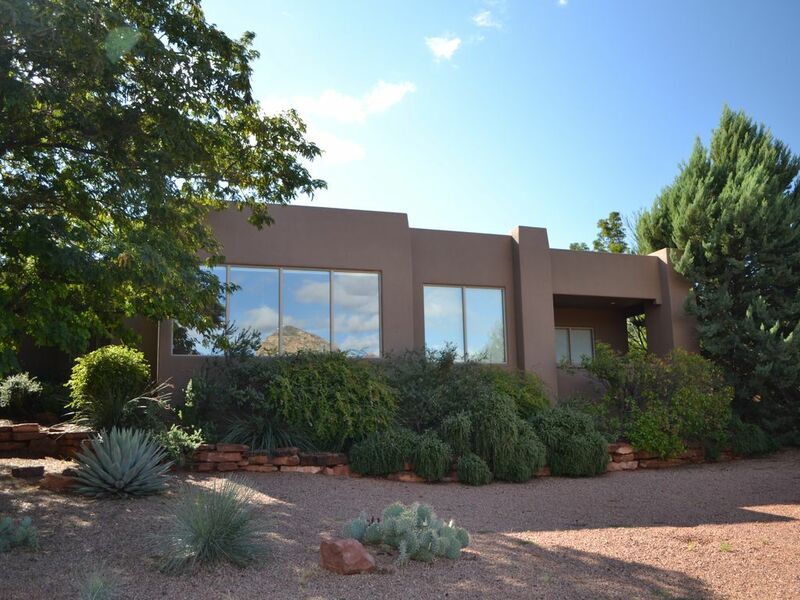 'Panoramic Heights' is walking distance to several gorgeous hiking trails, and short drive (less than five minute) to the red rock hiking trails in Sedona! Also walking or a short drive to shopping and galleries, gourmet restaurants, jeep tours, and two golf courses. This is truly a special home - perfect for your special vacation! I and my husband are geologists, and we love the geology and scenery in northern Arizona (particularly Sedona!). We fell in love with Sedona the first time we visited there. The energy in Sedona is amazing - we always feel wonderful when we visit there. We love hiking through the beautiful red rocks, golfing the gorgeous golf courses, visiting the galleries, and eating and the wonderful restaurants in Sedona. Our home has absolutely breathtaking red rock views. As soon as we wake up in the morning, we look out the huge windows and feel so much happiness! We love the high ceilings, spaciousness of the home, and the wonderful location near hiking trails, galleries, and restaurants. Top-quality bedding with down comforters and high threadcount luxury sheets. Top of the line, new appliances - kitchen is open to the living room and dining room, and has red rock views. An assortment of CDs provided. A large assortment of adult and children's movies. Private hot tub romantically situated under gazebo. High chair, crib, backpack for carrying child up to 40 pounds, a variety of toys, videos, and books for kids, high assortment of books including local guidebooks. Hiking from the home to the several wonderful trails with gorgeous panoramic views of Sedona and the red rocks, lookout point, and Vortex in Sedona. Walk to nearby restaurants, coffee shops, a Whole Foods market, day spa, and shops. Many more hiking trails, shops, restaurants, and art galleries are a short drive from the home. Two golf courses are 10-15 minutes from the house. Uptown Sedona is just a few minutes drive. Jeep rides and tours also available nearby, and mountain bike rentals are nearby as well. Our favorite hiking trail, 'Soldier's Pass,' is only 5 minute drive from the house.